Many people live with chronic pain. Pain that is present all of the time or most of the time for more than three months is considered chronic pain. 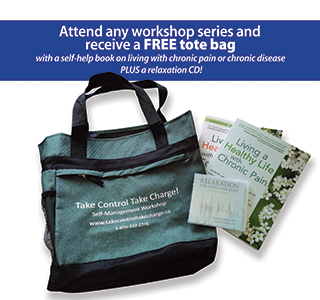 What happens at the Chronic Pain Self Management Workshop? This program is a free 6 week workshop for people who live with ongoing or chronic pain. Each week you will learn new ways to live with your chronic pain and improve the quality of your life. Find out about treatments that are available and best for you. The workshop is also available to caregivers to help them better support their loved ones. Everyone will receive free workshop materials. For more information call 1-855-333-2376 or browse our upcoming workshops.